MINNEAPOLIS — As the college basketball world converges on Minneapolis for the NCAA Tournament’s Final Four this weekend, Managers on a Mission, a local Christ-centered ministry, held an event Thursday called “Clean Out For A Cause,” during which 150 young people in the Twin Cities area came to the Minneapolis Convention Center to pick out and take home gear from donations made to MOAM by pro and college sports teams. During their visit, the young guests helped pack snack boxes for other kids the program helps, picked out some sports apparel to take home from the donated stash, and got to meet and hear motivational speeches by High Point University (N.C.) men’s basketball coach and former NCAA champion Tubby Smith, Timberwolves head coach Ryan Saunders, Timberwolves forward Anthony Tolliver, and Minnesota Gophers senior Jordan Murphy. 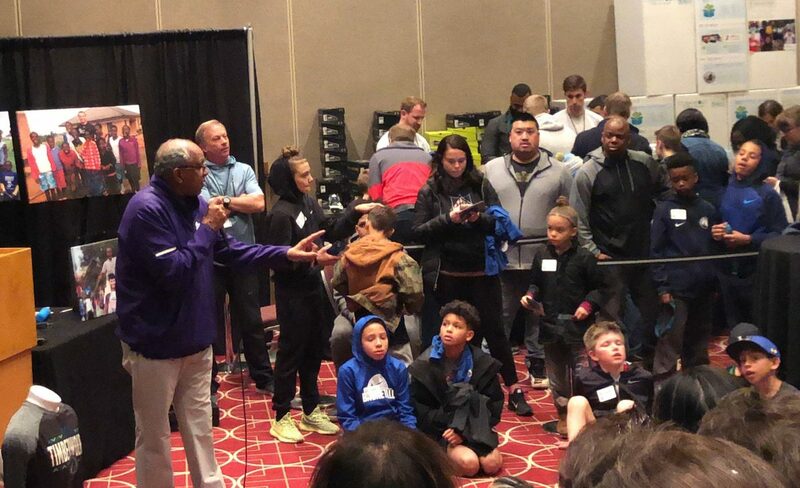 Smith, who won a college basketball title in 1998 when he was the head coach at Kentucky, spoke to the kids and their families about the importance of giving back and serving others. 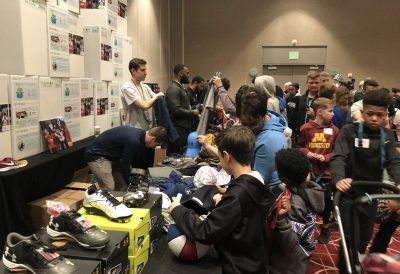 MOAM, started by Boe in 2013, has gathered excess apparel from more than 100 college programs and half of the nation’s pro sports teams over the past six years. Coach Smith, upon his departure from the University of Minnesota in 2013, made the first donation — 50 pounds worth of his old U of M gear he would no longer use since he had become the head coach at Texas Tech. MOAM’s primary desire is to develop Christ-centered future leaders of the sports industry through mission trips, service projects and scholarships. You can learn more about the organization’s work by visiting ManagersonaMission.org.